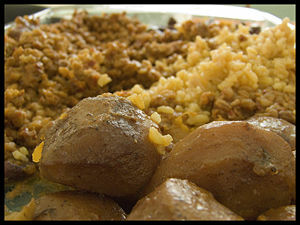 Please enjoy this clip I filmed about how chamin (Portuguese cholent) came to Philadelphia. It was filmed at Stenton Mansion, one of the best-preserved colonial homes in Philadelphia. I would like to extend my special thanks to Marlene Samoun for permitting me to use her soulful rendition of the ladino folk song Morenika in this clip. Jewish contact with Spain may go as far back as the Kingdom of Solomon. It is thought that Southern Spain was the country of Tarshish. Tarshish was the furthest place west that people could sail to from Ancient Israel in Biblical times. There was a continuous Jewish presence in Spain until March 31, 1492. Recipes and more after the jump. This was when the Alhambra Decree was issued, ordering the expulsion of the Jews from the Kingdom of Spain. The majority of these exiles moved to Portugal, but they were expelled from Portugal in 1498. As a result, the Spanish Jewish community was dispersed. A large number of these Jews navigated the 8.9 miles across the Straits of Gibraltar and resettled in the Maghreb (Morocco, Algeria, Tunisia, and Libya). A much smaller number ventured to America. They brought a very ancient dish with them. Its oldest name is chamin, which comes from the Hebrew word “cham” which means “hot.” Chamin is a dish that evolved so that Jews could comply with the rule of not kindling a flame on the Sabbath. In the Mishnah it says “tomnim et ha’chamim.” This oral tradition instructed Jewish people to “bury the hot.” In the countries of the Maghreb, the Arabic word for “buried” or “dafina” was adopted for this dish. No matter where they resettled, these Spanish and Portuguese exiles continued to cook the same special festive Sabbath dish. The Jews who settled in Eastern Europe continued this tradition under a different name. Their special Sabbath dish is called cholent. This name is believed to derive from the Hebrew word “she’lan” which means “rested overnight.” Several famous European dishes derive from chamin such as the French cassoulet, and the Spanish cocido madrileño. As the days grow colder, chamin is the perfect comfort food to prepare for Shabbat. I have a very special recipe to share with you. My daughter, who is spending a trimester in Israel, enjoyed home hospitality with the Ben Moshe family. Mrs. Yasmin Ben Moshe welcomed her Shabbat guests with her special Tunisian chamin. She has generously agreed to share her recipe with us. This recipe has been passed down orally in the Ben Moshe family for generations. Enjoy! Soak the wheat berries in water for one hour. In a large pot, mix 2 tablespoons of olive oil with ¼ tablespoon of sugar. Cook over high heat until the sugar caramelizes. Add 2 1/2 cups of water, 2 teaspoons of paprika, and 2 teaspoons of cumin. Bring to a boil, then add the wheat berries, and salt and pepper to taste. Simmer until all of the liquid has been absorbed. Add the cubed lamb and cover with water. Add the eggs and potatoes. Bring to a boil, and then simmer for 1/2 hour. Set aside and prepare the dumplings and sausage. In a pan, heat the olive oil, and then add the lamb fat. When it is hot, add the garlic, paprika, cumin, salt, and pepper, stirring well. Stir in the cup of ground bulgur wheat. Remove from heat. Mix in the minced parsley and egg. Blend everything together until it becomes a dough. Form the dough into little round dumplings and place in the Chamin pot. Combine all the ingredients in a bowl. Form a loaf with the mixture, and stuff it into the vegetable casing, or wrap it in the cheesecloth. Tie both ends with twine. Place in the chamin pot. Make sure that all the ingredients are covered with water. Preheat the oven to 250 degrees Fahrenheit. Cover the chamin pot tightly and place in the oven overnight. It should cook for 24 hours. Serve the eggs and potatoes first. Spoon plenty of gravy over them. Offer salt, cumin, and cayenne pepper so each diner can spice it to taste. Then serve the wheat berries, lamb, dumplings (kouclas), and sliced sausage (machshi). Cuanto mas tienes, mas quieres.